Another highly effective weight loss surgery is the laparoscopic sleeve gastrectomy, (LSG) also known as the vertical sleeve gastrectomy. Through five small incisions (between 0.5 and 1 inch) 85% of the stomach is removed. This transforms your stomach into a long tube or a “sleeve” similar to your shirt sleeve. The new stomach has a total capacity between 90 and 120 ml’s. People undergoing the laparoscopic sleeve gastrectomy eat a small amount of food (1-3 ounces) and they are full or satisfied. 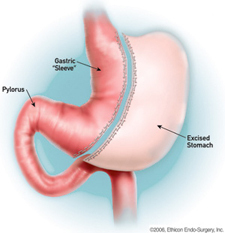 The laparoscopic sleeve gastrectomy is superior to the gastric bypass for several reasons. First, unlike the gastric bypass, the course or flow of food through the gastrointestinal tract is not altered. Therefore there is no dumping syndrome and the risks of nutritional deficiencies are minimal. Secondly, Ghrelin, the hunger hormone, is removed during the surgery when the outer portion of the stomach is removed. When Ghrelin levels are reduced the desire to eat is significantly diminished. Ghrelin levels have been found to be reduced 5 years following laparoscopic sleeve gastrectomy. In comparison, Ghrelin levels are not decreased in either the short or long term with the gastric bypass. Also the long term risks of gastric ulcers and internal hernias is eliminated with the sleeve, where they remain long term risks with gastric bypass patients. It is increasingly becoming evident that preservation of the pyloric valve is critical to the emptying of the stomach and therefore long term weight loss. The pyloric valve does not function in this manner any longer in people undergoing the gastric bypass. It continues to function normally in patients receiving the sleeve gastrectomy. Data recently presented at the International Sleeve Gastrectomy Summit, that Dr. Domkowski attended, demonstrates that weight loss with the laparoscopic sleeve gastrectomy is significant (60-70 percent of excess weight gone in 2 yrs) and is maintained long term, 60-70 percent maintenance at 6 yrs following surgery.